The Liminal artspace in Roanoke — attached to Community High School of Arts & Academics — hosts monthly readings. Most of the participants are short story writers, novelists, or poets — so my theatrical pieces there are definitely out of the ordinary. At the most recent reading on January 24, I offered up two pieces, which were both performed by Community High School students. Here are Joe Hart, Ashley Meador and DaQuan Saunders performing “The Dead Horse,” an absurdist piece of mine. This is the five-minute version; I’ve also developed it into a one-act, with a larger cast. Thanks to Cara Modisett, the organizer, who helped round up the students. And thanks to my wife, Katerina, for the unique prop. 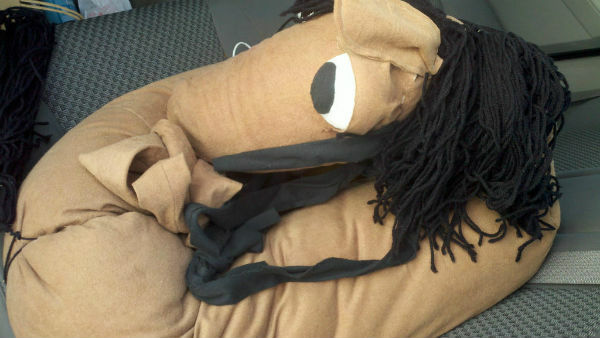 The dead horse here was first created as a Halloween costume for my son, Keith, many years ago. It’s put together so a small child (which is what Keith was then) could fit inside of it, with the body of the horse around him — a convenient way to both ride the horse, and still go trick-or-treating. I’ll post video of the other piece, “Pandora and Schrodinger: What’s in the Box?” when it becomes available. This entry was posted on February 9, 2013, 1:00 am and is filed under News, Productions, Uncategorized, Video. You can follow any responses to this entry through RSS 2.0. You can leave a response, or trackback from your own site.